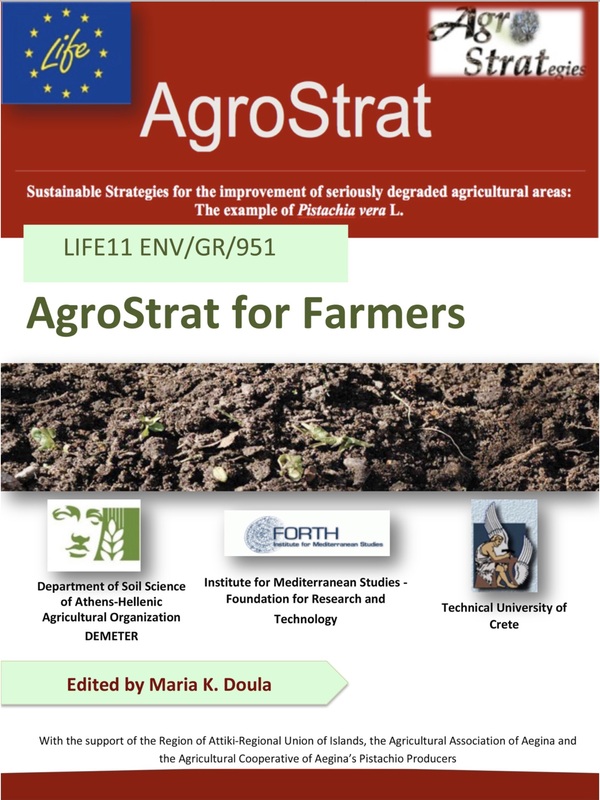 AgroStrat had as main objective the development of an Integrated Management Scenario (IMaS) for the sustainable management of intensively cultivated Mediterranean areas, using as example the cultivation of Pistacia vera L. trees (P. vera L.), which are intensively cultivated in Aegina Island, Greece for the last 150 years, but also in other Greek and Mediterranean areas. The project, during the 5 years of its duration, produced many innovative results, i.e. methodologies, web decision-making tools and strategic plans that have significant transferability potential. Focusing on the sustainability of intensively cultivated Mediterranean areas, AgroStrat addressed the issues of soil and water bodies protection, the promotion and adoption of good agricultural practices, the sustainable management of agricultural waste, as well as the sustainability of the rural environment as a whole, by working with those who are directly interested, i.e. the farmers and their associations as well as the local and regional authorities. 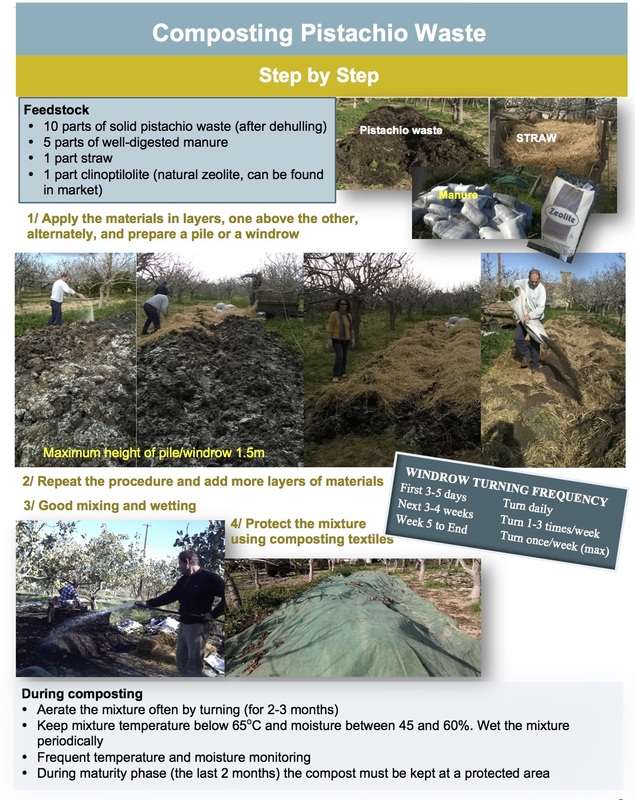 Furthermore, the implementation of an innovative holistic Life Cycle Analysis (LCA) enabled (i) the analysis of the life cycle of pistachio production in the island of Aegina in terms of current cultivation practices, waste production and management methods, (ii) the definition of agronomic and environmental feasibility of applying agricultural waste on soil after composting and (iii) the identification of critical processes that are energy intensive and cause most environmental impacts; based on these outcomes sustainable actions were proposed and applied successfully at field scale. Also, in order to assess the socio-economic impact of the project an integrated socio-economic impact assessment was performed based on reliable key impact indicators that were continuously monitored during the project duration. The IMaS although developed using the example of pistachio trees cultivation, it was structured in a such way that can be also implemented for other cultivation types and in other Med countries, thus ensuring its transferability. This is because the scenario proposes sustainable cultivation practices for Mediterranean areas under degradation/desertification risk, for sustainable soil and water monitoring and management, nutrients use, proper management of agricultural wastes (recycling, disposal, composting and use in agricultural sector, potential use of wastewater for irrigation, potential production of biochar) as well as, practices for minimizing soil salinization risk and erosion, while promoting soil protection in the long term. 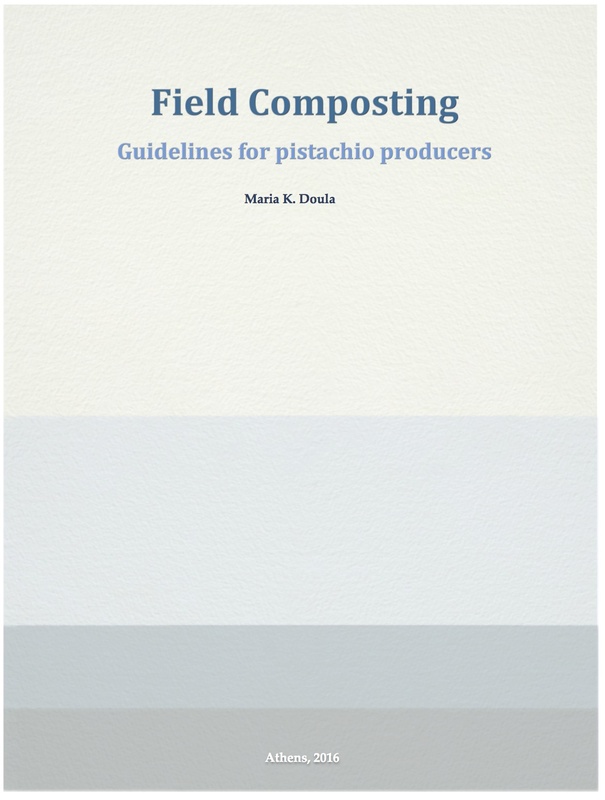 study the environmental footprint of pistachio cultivation and identify stages of high environmental impact (in terms of energy used, GHG emissions, risk for contaminating soil and water resources); based on these “hot spots” sustainable and corrective actions were proposed. 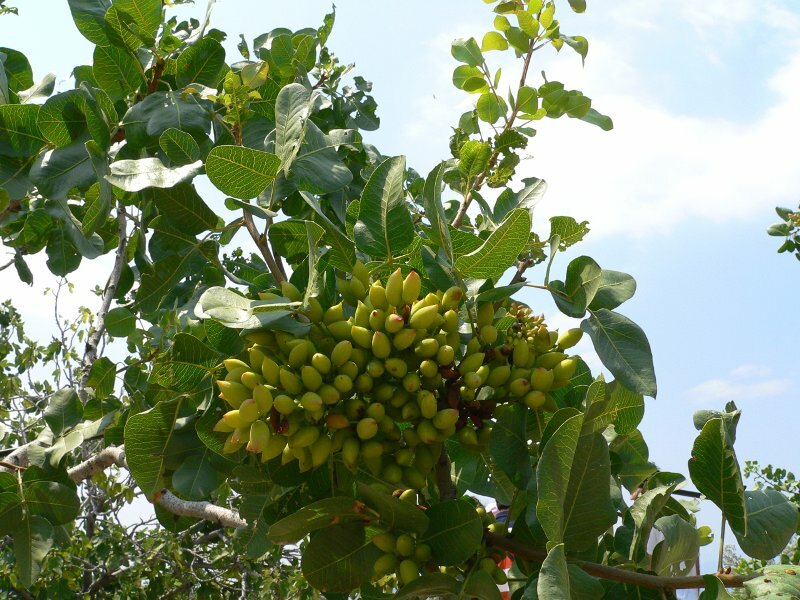 develop sets of reliable and representative environmental and socio-economic indicators to assess the overall impact of pistachio production and assist farmers and policy makers to take the appropriate decisions and improve sustainability of P. vera L. cultivation. 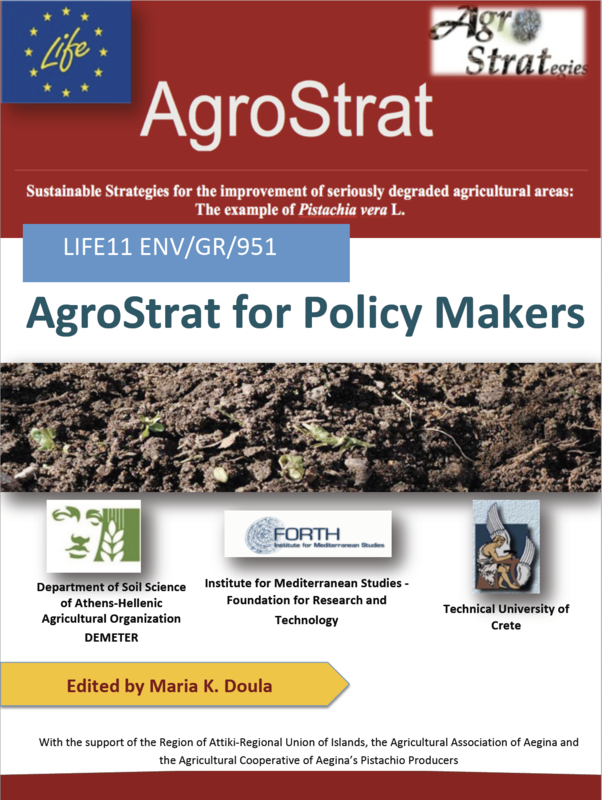 AgroStrat partners designed and implemented a very dynamic dissemination strategy throughout Greece and also in Cyprus, Italy and Spain, targeting mainly farmers and their associations as well as local and regional authorities. 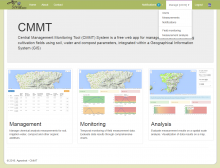 From a series of informative actions, events, workshops, open discussions, e-learning classes, and publications, the project gained the positive vote of the targeted stakeholders, also due to the success of the implemented pilot studies. Therefore, AgroStrat outputs have the comparative advantage of initial acceptance by the farmers and the authorities, i.e., the stakeholders who can and should implement them. Taking into account this positive view of the interested stakeholders, and in order to transfer the results to other regions of Greece and also other countries, a well designed and focused scaling up strategy was also developed. AgroStrat foresees also that the dynamicand carefully designed After LIFE Communication Plan and the continuous effort of all partners in the following years will ensure the best possible dissemination and communication of project results and enable their transferability in other cultivations, sectors, regions and countries.